When Dr. Frederick “Skip” M. Burkle, Jr. delivered the 2012 Leiter Lecture he started with an apology. “It’s not that uplifting,” he said of the topic of his talk, “but it is all quite accurate.” Dr. Burkle addressed challenging public health issues, and the potential for enhanced information management, in a talk titled “Future Humanitarian Crises: Challenges to Practice, Policy, and Public Health.” The lecture, held May 9 in the Lister Hill Center Auditorium, is archived and can be viewed on demand. Dr. Burkle is Senior Fellow and Scientist at the Harvard Humanitarian Initiative of the Harvard School of Public Health. He is a retired Captain in the US Naval Reserve who served in Vietnam and the Persian Gulf War, and with the US Central Command in Somalia. Reflecting on more than 40 years of experience in global health and disaster management, he urged the audience to look beyond the immediate effects of disasters to the indirect and delayed effects that impact the long-term safety and availability of basic resources such as water, food, shelter, sanitation, and energy. Such conditions can cause greater incidence of both communicable illnesses and chronic diseases far beyond that which occurred during the actual event. Dr. Burkle explained the devastating effect that armed conflict has on public health infrastructure, citing that this, not violence, is the cause of 70-90% of the deaths and illnesses that occur in these situations. He provided the example of cholera, which, after not being seen there for more than 20 years, re-emerged in Baghdad less than 10 days after the first Iraq war. He described rapid unsustainable urbanization as the major public health crisis of the 21st century. This phenomenon, driven by citizens who have been displaced by violence and who seek employment, shelter, and security in cities, occurs when the infrastructure for sanitation, water, food, and shelter cannot meet the demands of a rapidly increasing population. With cities such as Mumbai having as many as one million people per square kilometer in some areas, the rapid spread of infectious diseases becomes a given. In addition, food scarcity issues in areas of rapid urbanization, such as Guatemala, have led to 50-80% of the children suffering from chronic malnutrition. Dr. Burkle stressed the importance of collecting accurate data on displaced populations and disseminating current multidisciplinary information at the community level in order to track, prepare for, and respond to, emerging public health threats. The annual Leiter Lecture is jointly sponsored by NLM and the Medical Library Association (MLA) and was established in 1983 in honor of NLM’s first Associate Director of Library Operations, Joseph Leiter. 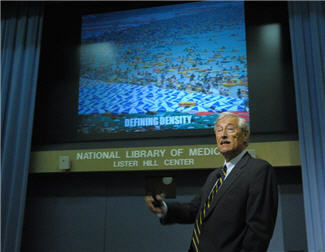 The 2012 lecture focusing on disasters and public health is a timely topic for both the NLM and MLA, as both are active in disaster information. NLM’s Disaster Information Management Research Center (DIMRC) develops and provides access to health information resources and technology for disaster preparedness, response, and recovery. DIMRC works with the MLA to create continuing education courses that support the Disaster Information Specialization for librarians and other interested professionals. August 31, 2012 in Events, Organizations. ← Dr. Lucy Ozarin, NLM Volunteer Extraordinaire!